The suffering of Punjab is long tale that begins with the Sikhs opting India instead of going with Pakistan or having their own separate state. Immediately after independence when the Nehru Govt withdrew certain concessions enjoyed by the minorities under the British Raj, the Sikhs protested and to counter this Nehru used 'Chamcha (sycophant) Sikhs' the Congressite like Kairon, Giani Gurmukh Singh Musafir, Baldev Singh etc. Slowly the Chamcha culture in Punjab became so dead sycophant that they supported all moves of Congress which went deadly against the Punjabi masses. The chamchas supported River Water allotment to neighbouring states, Shifting of Punjab Industry to Neighbouring States, Reduction of Sikh Percentage in Army, Operation Blue Star, Support for Presidential Rule in Punjab, Denying the Provincial Status to Punjabi Language etc. As we know the drugs were injected in Punjab through a conspiracy hatched during Indira Gandhi days and the big smugglers are virtually enjoying immunity. They have a network which consists of politicians also. Mostly the drugs originate from Afghanistan and reach India obviously through Pakistan. It is also being alleged that the smugglers simultaneously work for Indian intelligence agencies like the RAW. In the first place there is rampant corruption in Indian polices including BSF and secondly the RAW connection of smugglers facilitates the crossing of contrabands. Thus if the borders are thoroughly sealed the possibility of drug enterance in Punjab is automatically eradicated. Also the contraband like opium are not grown in Punjab. 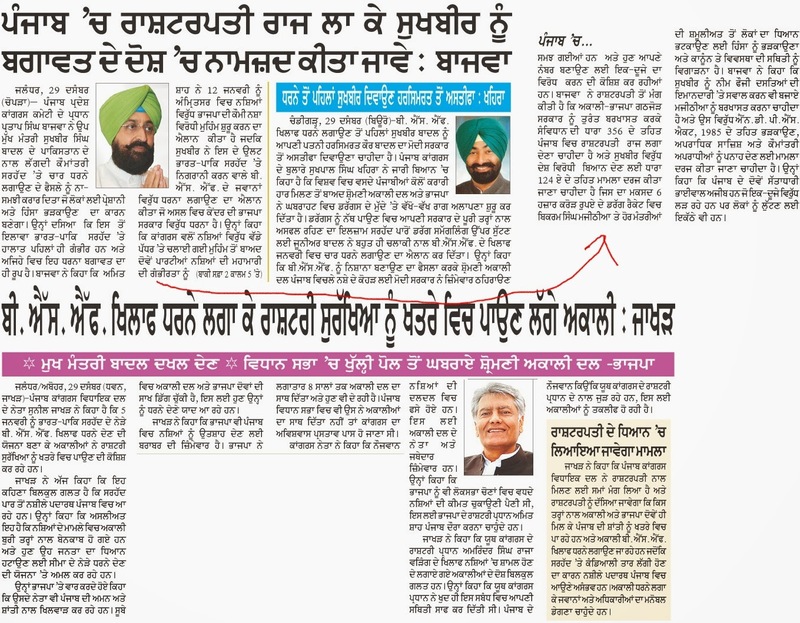 Thus if supply from neighbouring states is stopped the opium will also vanish from Punjab scene. Accordingly the Akali Dal decided to protest on Jan. 5, against the BSF for clandestinely allowing passage of contraband. It also requested the Centre to some how either stop production of opium or ensure that this is not passed in Punjab. Obviously this is hitting at the root of the whole problem and why should the conspirator tolerate it. Obviously it happened. Yes. The Congress cried. It cried loud. Not a simple political opposition. It straightaway demanded dismissal of a democratically elected Govt. Not only this, it said that a case of sedition be booked against the Chief Minister. Question arises is the announcement of protest demonstration against BSF seditious? Has it not been done in the past? Have the people not even protested against army what to talk of BSF? The answer is, not once but hundreds of times in the past have been protests against the army. There have been instances where naked women protested against army. And this is in the spirit of a democracy. It you disallow it , it means you are disallowing functioning of democracy. But unfortunately the Punjab CM instead of adhering to the principled stand has taken a u turn. Now he says, "No, the protest is not against BSF it is against Pakistan." What more unfortunate could there be.